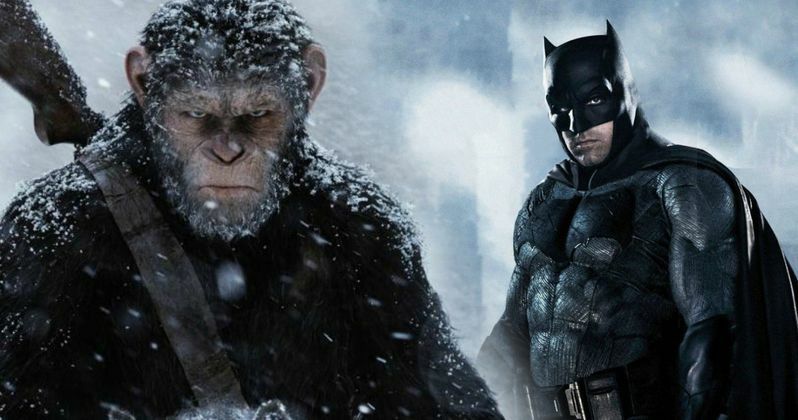 While the Batman and Planet of the Apes don't exactly have many common threads, besides being iconic film franchises, they now share a director in Matt Reeves. The filmmaker took the helm of the 2014 blockbuster Dawn of the Planet of the Apes and the upcoming War for the Planet of the Apes, in theaters July 14. With The Batman filming set to commence at some point next year, the filmmaker teased that his two franchise may have more in common than you'd think. Los Angeles Daily News caught up with Matt Reeves, who revealed that both the Batman franchise and the Planet of the Apes franchise were very close to him as a kid, and now he's directly involved in both of them. The director also spoke about how Bruce Wayne (Ben Affleck) and the ape leader Caesar (Andy Serkis) are more similar characters than you may imagine. Here's what he had to say below. "It's a strange thing to be involved in the two franchises which were the two that I was connected to most as a child. I just was obsessed with Batman when I was a kid. What I find so interesting about him as a character is that, as far a superhero goes, he's not superhuman, he is a person. And he is a tortured soul who is grappling with his past and trying to find a way to be in a world that has a lot that's wrong with it and trying to find a way to reconcile all of that. That is a really powerful character, in the same way that Caesar is such a powerful character." Earlier this month a report surfaced that claimed 4 Batman movies were being planned for release in 2019, all of which will feature the Caped Crusader. While this plan has yet to be confirmed by Warner Bros. or DC, the rumor claims that Gotham City Sirens is coming around Valentine's Day weekend, with Nightwing debuting over Memorial Day weekend, Batgirl arriving in August and The Batman in November. That release plan has yet to be confirmed, but it certainly does seem feasible. Aside from Ben Affleck reprising his Bruce Wayne/Batman role from Batman v Superman: Dawn of Justice and Suicide Squad, the cast also includes Joe Manganiello as Deathstroke, although no one else has been confirmed yet. Matt Reeves is directing from a script that was recently rewritten by Chris Terrio. Hopefully we'll have much more on The Batman soon, including confirmation of this four-movie Batman plan.